Whether you call it vaping, smoking e-cigs, or something else, the fact remains that there’s been a widespread increase in electronic cigarette use. At my Long Grove dental office, we’re always concerned with the oral health and overall health of our patients. While we know smoking cigarettes increases the risk for oral cancer and other serious problems, we wanted to know more about the risks of e-cigarettes. Ever since they entered the U.S. market in 2007, e-cigarette sales has increased fast. So fast that science hasn’t been able to keep up with researching potential side effects. There’s little known about whether e-cigs help smokers quit lighting up, and there’s even less information about what some of the harmful side effects may be. So until more conclusive research is complete, here’s what we do know. 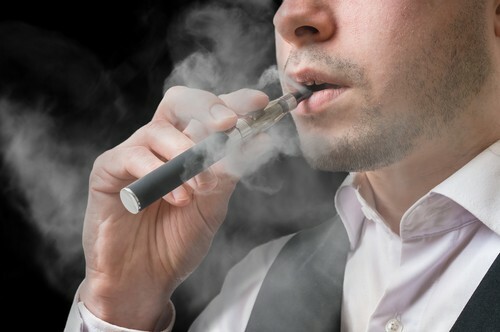 Some risks associated with e-cigarette use include: pneumonia, rapid heart rate, congestive heart failure, airway resistance, and an increased chance for gum damage. One study concluded that e-cigarettes with nicotine helped current smokers reduce the amount of cigarettes they smoked by about half. On the contrary, another study suggested that smokers who use e-cigs are 59% less likely to quit. Basically, more research is needed before we can determine whether or not e-cigarettes may help smokers quit without leading to more complications. In the meantime, there are other ways you can stop smoking. We all know that smoking is bad for both our oral health and our overall health. But quitting isn’t easy. Nicotine is addictive, and that makes it incredibly hard to re-train your body to not crave it anymore. Before jumping on the e-cigarette train, at least until more conclusive research is done, consider some alternatives to help you quit. Work on limiting the number of cigarettes you smoke a day, and decrease over time. Try quitting without the use of nicotine replacements — fair warning, this can be extremely difficult. Find different ways people have quit. You never know what may work for you. The American Lung Association is a great resource for smokers who want to quit. Whether this is the first or seventh time you’ve tried to stop smoking, don’t give up. In the meantime, make sure you keep appointments with your Long Grove dentist so that if any oral health problems do arise, they can be caught and treated early. Welcoming patients from Long Grove, Buffalo Grove, Lake Zurich.